On January 11, 1934, following specifications laid down by Heinz Guderian, the Army Weapons Department drew up plans for a medium tank with a maximum weight of 24,000 kg and a top speed of 35 km/h. It was intended as the main tank of the German Panzer divisions, capable of engaging and destroying opposing tank forces. Daimler-Benz, Krupp, MAN, and Rheinmetall all produced prototypes. Testing of the prototypes took place in 1936 and 1937, leading to the Daimler-Benz design being chosen for production. The first Panzer III A came off the assembly line in May of 1937, and a total of ten, two of which were unarmed, were produced in 1937. Mass production of the tank, then in model III F, began in 1939. Between 1937 and 1940, attempts were made to standardize parts between Krupp's Panzer IV and Daimler-Benz's Panzer III. Much of the early development work on the Panzer III was a quest for a suitable suspension. Several varieties of leaf-spring suspensions were tried on Ausf A through D before the torsion-bar suspension of the Ausf E was standardized. The Panzer III, along with the Soviet KV heavy tank, was one of the first tanks to use this suspension design. The Panzer III was intended as the main battle tank of the German forces. It outclassed most of the tanks of the time However, when it initially met the Soviet KV and T-34 tank designs it proved to be inferior. To meet the growing need to counter the T-34 the Panzer III was upgunned with the 50mm KwK 39 L/60 and received more armor which made it a very formidable opponent for the T-34. This still failed to address the problem caused by the KV tanks though, so in 1942, several self propelled guns as well as the longer barreled 75mm Kwk 40 L/43 Panzer IV Ausf F2 and the Panzer IV Ausf G were developed and produced. The Ausf.M was successor to the Ausf.L, and it shared the same 5cm KwK39 L/60 main gun. Among its modifications was a deep-wading muffler with a series of associated hatch seals that allowed fording of water obstacles up to a depth of 1.3m. This performance represented a significant fording improvement over earlier Panzer IIIs. The hull-mounted smoke generators were also replaced with three 90mm NbK dischargers mounted either side of the turret. A total of 250 new Ausf.M tanks were produced from October 1942 to February 1943. 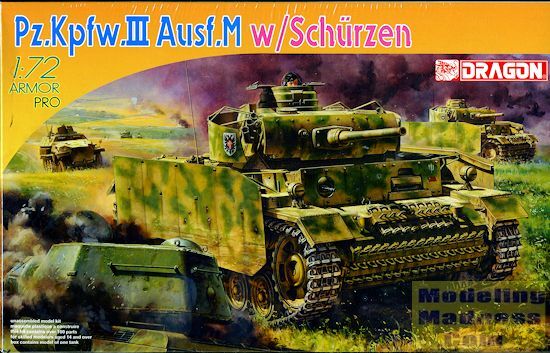 This is another addition to Dragon's growing Panzer III collection in 1/72 scale. Those with a good memory will recall that this same basic variant done a couple of years back. I anticipate even more versions being done as time goes on. This is, by my count, the fifth Panzer III in this scale and there may well be ones I have missed. The kit includes a single piece hull with a one-piece upper surface. The Panzer III had quite a few road wheels and so it is with this kit. In fact, I would have to say that about half the parts count is wheels, rollers and sprockets. There are even spares to attach on the fenders. The kit provides a nice photo etch enhancement in the form of intake and exhaust grilles, something that is perfect for this medium. The kit also includes Dragon's superb DS tracks. The turret includes a nicely done gun and mantlet along with the bustle that was used on this version. 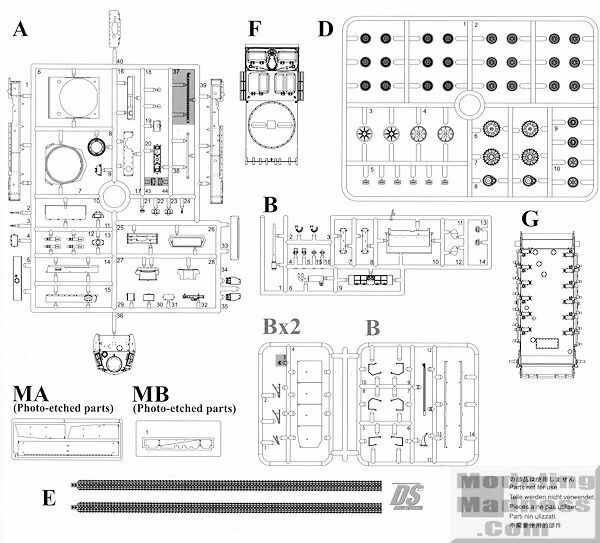 What is different on this kit of the ausf M is the inclusion of plastic sprues and photo etch fret that includes the hull and turret schurzen along with their attachment brackets. Confusingly, these new sprues are also labeled 'B'. This kit provides three different markings options, all from Kursk where the side shields were first used. All are very similar to the box art tank with different camo patterns. The small decal sheet is well printed and should go on without any problems. I dare say that this one will end up selling just as well as previous versions. After all, the Panzer III makes into a kit that is a pretty nice size and is not all that involved when it comes to building it. With only about 100 parts, it could be considered a featherweight! Like all of Dragon's armor kits, this one needs to be built carefully, but will result in a fine replica when finished.